You know those people who always seem to have the perfect answer to every one of your career questions? No matter how lost in the forest you may be, unsure of who you are, where you're going, and what on Earth you are doing, in one simple sentence they somehow power up your inner GPS and all of a sudden, you are face to face with the answers to all of your big questions. If anyone has that superpower, it is Molly Beck. Molly is the creator of the lifestyle blog Smart, Pretty, & Awkward, founder of the podcast creation site Messy Bun, and a marketing expert who provides digital strategies for companies including Forbes, Venmo, Rice University, and Hearst. Most recently, she is the author of Reach Out,a fun, practical guide to building valuable career connections through tools you already have and people you already know. I met Molly through her blog many years ago and even amidst the crowded blogosphere, I have yet to find another platform like Smart, Pretty, & Awkward. Each post has three pieces of advice: How to be Smarter, How to be Prettier, and How to be (less) Awkward. And trust me, it's jam-packed with advice you never even knew you needed. Then there's Messy Bun, which is making it easier for anyone to become a podcast pro. With no special equipment or skills required, an aspiring podcast host can record and amplify their voices painlessly and easily. 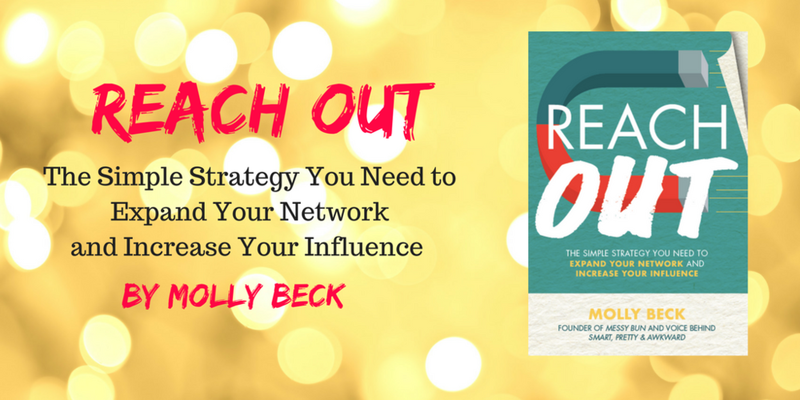 Messy Bun also serves as the main case study through Reach Out, and Molly shares how she's launching the brand by using the networking principles in the book. With all those experiences under her belt, it's no wonder she wrote the book on using the tools you have to create the career, network, and influence you desire. 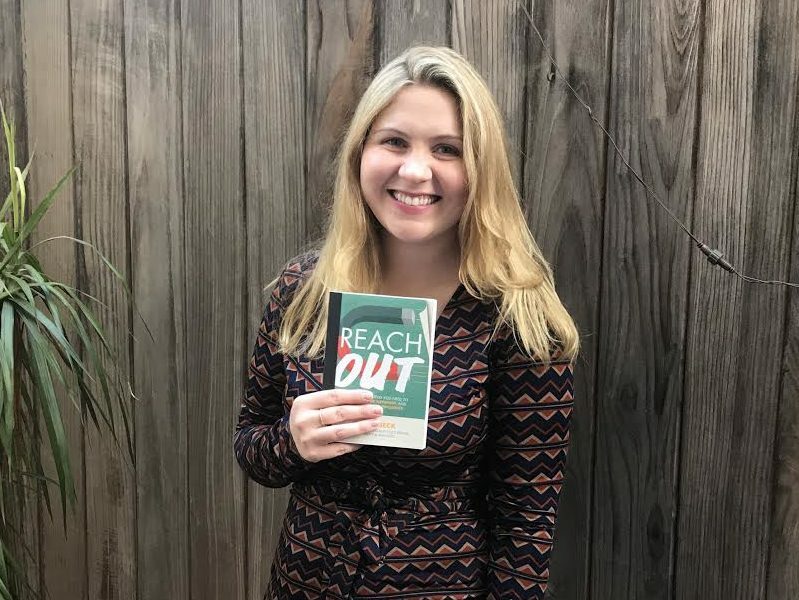 Reach Out was inspired by a viral story she shared for Forbes.com's Mentoring Moments series, where she scheduled time for reaching out into her daily calendar and it had a profound affect on her professional life. While packaging all of Molly's advice into one interview is impossible (that's why you should order Reach Out), we collected some of our most burning questions on the often arduous practice of networking. Read on for Molly's wisdom. In Reach Out, you talk about the power of a digital presence. Is it enough anymore to simply have a LinkedIn profile? A LinkedIn profile is great to have, and I would absolutely start there by making sure it’s up to date and the profile is completely filled out. But... a LinkedIn profile alone isn’t enough of a digital presence. You also want to be active on at least one other social media site, and sharing professional-ish content on that site. Being active on social media provides visibility (other people can find you) and credibility (you are who you say you are). When someone googles your name, you want as many results as possible to come up, and to have them all present a professional image. It seems everyone has some kind of digital presence today. What does it take to make yours a networking asset? Besides Reaching Out to others, you also want to position yourself to be a good person for others to Reach Out to you: then opportunities can start coming to you. Make your email address, or any other way you prefer to be contacted, easily visible on all the platforms you are active on, including LinkedIn (where recruiters often look). Let’s say someone isn’t in a big city or the people they want to connect with are far away. How can they build genuine connections? The great thing about the internet is that someone who lives in a small town can now network using the same tools as someone in a large city. Instead of meeting for coffee or attending a networking event together, have an “almost-in-person” meeting via a phone call or Skype session— these can be just as valuable as a face-to-face meeting, and they are free (you don’t even need to buy anyone a cup of coffee). If you also know you are planning a trip to a specific city in a few months, you can start focusing on Reaching Out to people that live in that city now, and then ask them for coffee in-person once it gets closer. We often hear that the best way to ask for someone’s guidance or mentorship is for it to be mutually beneficial. How can a young woman who may not have a big network or feel that she has much to offer actually create a mutually beneficial relationship? Something that is free and can help you stand out is to share an article or book recommendation you think the other person might enjoy. An article or book recommendation subtly demonstrates to them that you share similar interests and that you are “in the know” with current industry trends or news, plus it adds value to the person you are Reaching Out to. Just try not to send something that the Target probably has seen already - link to articles that have just come out and share books that haven’t been at the top of the bestseller list for weeks. Doing a quick scan of their social media to make sure the person hasn’t already shared the article or book can’t hurt, either. Whether you’re in college or in a big city, there seems to be a networking event every night of the week. Do you think they are still of value or is there a better avenue to work towards strengthening your network? There is always value in going to events where you will meet more people – if you follow up. Nobody pitches, accepts, and signs a partnership agreement at a party. It’s not likely you’ll be offered a new job while eating your conference boxed lunch. All the magic happens in the follow-up. If 10 people go to an event and 9 of them exchange business cards, usually only 1 or 2 will actually follow up to start in touch. To be memorable, be the one follows up. Reach Out is filled with studies and statistics on networking. Was there a stat that particularly surprised you? Yes! A study by Yesware’s data scientists found that email subject lines that are more likely to be both opened and responded to are title case. Title case means that every important word in the subject line is capitalized. Just changing your subject line from “Loved your speech yesterday - looking to connect” to “Loved Your Speech Yesterday – Looking to Connect” can make a difference in response rates! Networking can feel extremely intimidating. What’s your advice for staying confident in what can sometimes feel like an awkward situation? “How are you?” (The person will most likely say something nondescript, like “Good,” or make some sort of funny joke, like “Fighting my way through the crowds for a piece of cake.” React to what the person said; e.g., “I know! It’s packed in here!”) Then transition into . . . In your personal experience, what has been the most valuable networking lesson you’ve learned in your career? That no connection is ever a “waste.” Sometimes I email or get coffee with people and nothing happens – there are no action items, no obvious ways we can work together, and no clear opportunity came of it for either of us. This used to frustrate me and make me feel like I was wasting time. But now that I’ve been networking for longer, I am seeing the value in a long-term network, not a short term one. In the digital age, companies are expanding and shifting at such a rapid rate that a person you have nothing in common with today, might end up being your dream boss tomorrow. Five years ago someone starting their own gourmet bakery would think they had nothing in common with an aspiring television producer, and now they might both be trying to find a contact at Amazon – you never know what the future will look like. Preorder Reach Out on Amazon here. If you order before 9/29, you'll get access to the preorder bonuses here!